Vocational Colleges (KV) was introduced by the Ministry of Education to increase the number of students in technical and vocational fields, and open wider opportunities for the school leavers in the job market. KV o ers vocational education and skills training with 30% academic component and 70% practical component. The vocational stream leads to Malaysian Vocational Certificate (Sijil Vokasional Malaysia, SVM) and Malaysian Vocational Diploma (Diploma Vokasional Malaysia, DVM), while skills training o ers the Malaysian Skills Certificate (Sijil Kemahiran Malaysia, SKM). There is high demand from the industries for semi-skilled and skilled graduates from KV. Some KV graduates have also started their own businesses and become young entrepreneurs after completing their TVET. Four graduates from KV have proven that the technical and vocational education received have benefitted them thus enabling them to contribute towards our nation’s progress. Mohd Qayyum Bin Mohd Shaimi, a graduate of Kolej Vokasional Muadzam Shah, Pahang, was confereed the DVM in Construction Technology in 2016, and currently is a young entrepreneur in the construction field. Qayyum’s interest in the construction field was nurtured by his father, a building contractor, since he was 13 years old. Not to delay his ambition, this young man started his company, Qsam Trading in his final year at the KV with financial assistance from his family. To date, his company has managed to employ ten workers, and he also employed two of his friends from the same KV to work with him. Currently, he is undergoing an intensive training at Tilista Feruni Tiling Academy to enhance his skills in professional tiling services. The two following female graduates from Kolej Vokasional Sg Petani 1, Kedah were the best students in the welding field. They had proven that female students could compete with male students and become skilled blue-collar workers in the oil and gas industry by joining the welding technology field. Both passed the Vocational Education Training Academy (VETA) leadership course during their study. The VETA certificate is recognised by the Ministry of Human Resource and the Department of Skills Training and also the industrywide renowned professional certification by Lloyd’s Register, an international professional body. To see this particular figure of a man walking around SMK Putrajaya Presint 8(1) is not something strange for the students. En. Mohd Zaini bin Mohd Said, a father of two students in the school made the school his second home starting from March 2016 when he was appointed as the committee member of the PIBG, headed by Tuan Hj Roslan Abu Hanif. The PIBG committee often collectively discusses in meetings or via Whatsapp group on ways to help the school improve students’ knowledge and build their character. The school and the PIBG decided that school and discipline were the two pressing issues which needed immediate attention. Convinced that these two issues were inter-related, En. Zaini and a few fathers took proactive measures to patrol the area around the school after school started each morning to identify students who often skipped school or were involved in discipline problems. After two months of continuous monitoring, truant students were identified and a discussion with the parents was held. Collective e orts were carried out to ensure the students reformed academically, while the school counsellor with consent from their parents, counselled the students to turn over a new leaf. Positive punishments were meted out and these were to assist En Zaini and a few fathers to repair the school toilets, to beautify the school landscape and to do minor maintenance work. “My experience and work as a contractor allow me to help the school in doing minor maintenance work. I am thankful that I have the time with the PIBG to implement various activities, whether academically or character building, for the sake of our children,” he added. Pn Nor Hayati Ishak, Senior Assistant (Student Affairs) expressed her gratitude for the unwavering commitment of the PIBG, especially to En Zaini who was willing to help the school at all times. Inclusive education aims to provide equitable education opportunities for students with special education needs (SEN) in the same classroom as their mainstream peers. Interactions between SEN students and mainstream students are beneficial to all as the mainstream students will increase knowledge about the needs of SEN students besides inculcating positives values such as cooperation and helpfulness. SEN students will also be able to build self-confidence and have opportunities to carry out numerous school activities alongside their peers. SK Changkat Larut, Taiping, Perak and SK Long Jaafar, Kamunting, Perak are in the District of Larut, Matang and Selama in Perak. The two schools were among the five schools chosen to be the pioneer schools for the Holistic Inclusive Education Programme (HIEP), which is a new model for inclusive education. The programme was a collaboration between the Ministry of Education and the University of Science, Malaysia. SK Changkat Larut has five special education classes with six teachers and four teacher assistants. Most SEN students in the schools are in the learning disability category who had yet to master the 3R (reading, writing and arithmetic). Students from the special education classes were screened to ensure their mastery in basic literacy and numeracy and achieve the appropriate skills level to enable them to join the inclusive education programme and study together with their mainstream friends. Senior Assistant for Special Education, En. Mohd. Azaini Sham bin Mohd Ali, informed that SK Changkat Larut implemented a comprehensive special education programme. Students’ learning was based on students’ ability. For those who were not academically inclined, they were enrolled in inclusive programmes in sports and co- curricular activities, and uniformed bodies. Headmaster of SK Long Jaafar, Tn. Hj. Mohd Nasir bin Abu Bakar notified that inclusive education in his school was well received by parents with SEN children. He suggested that parents with SEN children identify their children’s ability as early as possible. Parents need to contact special education schools or schools with inclusive education and see a doctor for confirmation or get support from relevant parties so that the children could be registered at special education schools or schools with a special education programme. Affini was happy to be in the inclusive education programme as she could interact with many friends and had a teacher who was caring and understand her ability. “My teacher and friends are good to me. My friends help me in my studies and my needs. The school has provided a toilet specifically for me which makes things easier. My teachers are helpful and always encourage me to study.” Affini’s advice to other SEN students, “Keep up with the good efforts, do not give up and always say your prayers. Irfan voiced his feelings of being in the inclusive education programme, “I like the school as it is a fun place to be in. I have many friends, the teachers are kind, and the food in the canteen is good. My teacher teaches us to write and read, and it is fun. My friends also teach me to write.” Irfan is also one of the football players for his school. Early identification of SEN children and providing them with the right education programme are essential towards developing their potentials and raising their confidence to become productive citizens. This action can contribute towards the development of a caring and inclusive nation. SMK Bukit Jelutong is in the Guthrie housing area in Bukit Jelutong, Shah Alam. The school started operations on January 6, 2003. The school is a co-ed school with students from various background and races. With more than 1,000 enrolment, the school encourages unity among the students in all activities organised by the school. All students are given the opportunity to participate in the numerous co-curricular activities within the school. 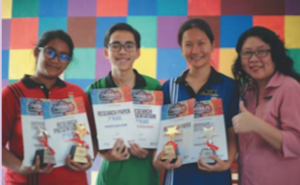 One of the co-curricular activities which made the school proud in 2016 was the participation and victory achieved by the school team in the STEP Sunburst Brain Camp International Competition which was organised by the National University of Singapore (NUS) in Singapore. The school team comprised four Form 4 students namely, Muhammad Adam Jefri bin Johan, Yew Wan Hu, Mohamad Mukhzuhayr bin Mohd Rashid and Barghavi a/p Visualingam. The teacher/chaperone was Pn. Seow Sek Ling. The team won first place in the Research Paper category and second place in the Research Presentation category. St. John’s Institution is a public all-boys’ school and one of the oldest schools in Kuala Lumpur. Various co-curricular activities are run with student participations from the lower secondary to the post-secondary levels. One of the co-curricular activities which becomes the school’s pride is the school band, the Naval Cadet Band, which consists of members from Form 1 to Form 5. In 2016, the St John’s Institution marching band continued to make the school proud at the international arena when it became among the top five band in the 2016 World Championship of Marching Showbands. The involvement of students from di erent races and levels of education had established a high level of unity and teamwork among them. SMK Cheras is a school located in Bandar Tun Razak, Kuala Lumpur, which is five kilometres from Kuala Lumpur city centre. The school is within a 14.6 acres of land which enables it to cater to the boys and girls of various ethnicity around Cheras. The student composition of the school varies – 55% are Malay, 35% are Chinese while the rest comprise Indians and other ethnicities. About 50% of students is in the urban poor category. The school has 42 units of cocurricular bodies, which include sports and games, societies and clubs, and uniformed bodies. Gamelan, one of the co-curricular activities, managed to unite students of different ethnicities in SMK Cheras through the training sessions and musical presentations. Virtual Learning Environment (VLE) is a web-based online learning system which is easy, fun and interesting. Schools in Malaysia are provided with Frog VLE free of charge. Frog VLE is an easy to use learning platform and a gateway for numerous education resources and interesting applications from innumerable websites. VLE is also a platform which enables teachers, students and parents to access information on learning and current education news. SK Meru 2 is one of the examples of a school which successfully leverages on VLE for students’ learning. SK Meru 2 is in Meru, a small town in the District of Klang, Selangor. This town in now booming due to the development of new townships around it. The school, with 2.3 hectares of land and surrounded by palm oil estates and Malay villages continues to flourish in terms of quality education o ered to the local children through using internet for learning. VLE-based learning in SK Meru 2 is championed by Cikgu Mohammad Azmi bin Hj. Muda. Cikgu Azmi is motivated to make teaching and learning using VLE fun and easy for students and teachers in the school. Azmi firmly stressed, “VLE is a platform which is safe and not limited to certain groups. In fact, it is a shared platform which can be generated by all education fraternities in Malaysia free of charge. VLE makes learning more fun for the students.” Students became excited with the use of technology as learning was fun and interactive. Teachers too found it beneficial as assessments and the scoring process was automated and e cient. The use of VLE in SK Meru2 managed to strengthen communication and the discussions between teachers and students. Teachers discovered that it was helpful in the sharing of learning materials and providing group assignments. To sustain the integration of technology in learning, Cikgu Azmi implemented various learning activities including online competitions and online quizzes among classes. Due to his dedication and determination in supporting the use of virtual learning, Cikgu Mohammad Azmi was awarded the 1BestariNet Teacher Awards (1BNTA) in Communication in 2016. SJKT Ladang Sungai Sebaling, Bahau, Negeri Sembilan is an under-enrolled school located in Sungai Sebaling Estate. Even though located quite far in the rural area with a handful of students, the school is not deprived from internet connection and virtual learning is highly encouraged.